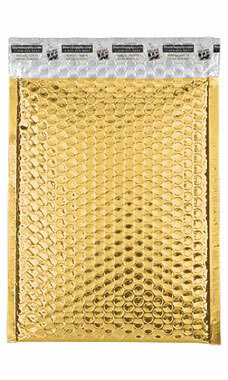 The Medium Gold Glamour Bubble Mailers are a stylish way to ship merchandise to your customers. This size is great for a variety of different products such as craft supplies, picture frames, and any other mid-sized merchandise. These mailers are 9"W x 11 1/2"H and are a glamourous gold color with an adhesive seal closure.